With over 4,000 customers and 40 million users, SuccessFactors is the most widely adopted Software-as-a-Service (SaaS) business software in the world. SuccessFactors is a full-suite Human Capital Management (HCM) solution that directly links an organisations’ people strategy to their business strategy – what we call ‘Business Execution’. SAP SuccessFactors Employee Central is the industry’s only Core HR solution that not only provides comprehensive, integrated Core HR capabilities, but also one that is specifically designed for business execution. Integrates with Talent – through seamless integration with talent management, Employee Central provides the ability to make more impactful workforce decisions. Includes Actionable Analytics – Employee Central provides simple reporting tools, with 2000+ built-in metrics and benchmarks that enable powerful measurement capability to improve overall business results. Supports Collaboration around Business Goals – Employee Central enables employees to leverage their talent, Core HR, and personal profile data to collaborate on business goals. It provides intuitive tools to form groups, network, and share knowledge around common goals, interests, projects, work experience, locations, and much more. Designed for Everyone – Like all of SAP SuccessFactors’ offerings, Employee Central is built for its 10 million users in the cloud. This approach results in a radically simple user experience for every role in the organization. Provides Seamless Integration – SAP SuccessFactors handles the integration between Employee Central and any other systems. Its cloud-based integration platform enables enterprise-class, fast, and cost-effective integration. Powerful Reporting and Analytics right out of the box – SuccessFactors provides customers with an extensive set of reporting and analytical capability as part of the base platform. All customers have access to an online reporting tool that provides the ability to build your own reports. These can be in the form of simple lists, or more advanced cross-tabs / pivots. These can be combined with charting and formatting into multi-page reports for distribution within the company. Output formats include PDF, Word, PowerPoint and Excel. Access to build and run reports are permissions that can be granted to authorised users. 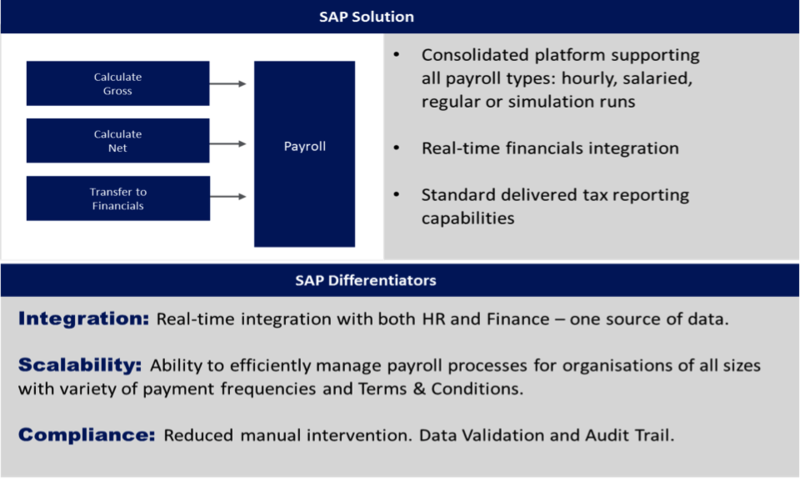 Employee Central Payroll provides organisations with the opportunity to manage their payroll using SAP’s award winning Payroll Engine, but with the flexibility of the cloud. SAP SuccessFactors’ talent management suite ensures organisational alignment, optimising people performance, and building competitive advantage with greater workforce insights. SAP provides a complete suite of talent management solutions that bridge the gap between strategy and execution by optimising people productivity. It provides the tools to hire, reward and develop the right people with the right skills. Talent acquisition is a collaborative process involving recruiters, HR, hiring managers, and peers. But often, recruiting processes and functions are siloed from the rest of the business. SuccessFactors Recruiting Management is a comprehensive, collaborative tool that extends the process of recruiting wherever in the world or on the go, to help you hire the best talent and drive real business value. Get a consumer-grade experience: The best-in-class experience, on a desktop computer or a mobile device, makes using SuccessFactors easy for all types of users and effective for power users. Improve collaboration: Initiate and track team discussions about candidates with SuccessFactors Jam. Access anywhere, anytime: Support your mobile workforce and keep the hiring process moving with mobile access to key recruiting features across devices (smartphones and tablets). Utilize industry best practices: SuccessFactors is driven by customer best practices. This makes all of our customers better recruiters regardless of wherever they may be in their recruiting programs. Gain more insight: Answer questions about how your recruiting results align with your overall talent strategy. Integrated talent management suite: Combine with Workforce Planning and Workforce Analytics to understand your talent pipeline needs or with Onboarding to increase employee engagement and reduce time to contribution. SAP SuccessFactors Onboarding gets new employees engaged faster, before their ‘start date’, streamlining the process and paperwork before day one, and then gets your new hire ramped up fast with our employee network and content-sharing solution. Engage new employees quickly – Connect new employees to a secure talent portal from outside the company firewall before they even start. Automate form delivery – Online forms available in Onboarding ensure that new employees don’t spend their first day filling out paperwork. Manage internal tasks – Send email notifications to IT, security, and anyone else who is part of the onboarding process to ‘kick start’ the process for making sure everything is in place on day one for the new employee. Schedule workflow – Keep processes on track using automatic task triggers and new-hire reminders. Identify High Performers – Provides executives and managers with real time actionable insight into organisational performance. Increase Completion Rates – An easy-to-use user interface promotes fast user adoption, increasing performance review completion rates. Develop Talent – Writing assistants and configurable routing turn performance reviews into a valuable ongoing feedback loop between managers, subordinates, and peers. Improve Compliance – Audit trail of legally discoverable documents, evidence of an objective review process, and ‘Legal Scan’ capability help ensure compliance with local regulations. Compensation Management streamlines and simplifies compensation planning, provides visibility and insight for total compensation management, and uniquely enables a perform-and-reward culture. Learning Management is closely coupled with Performance & Goals and Career Development & Succession Planning. This solution is a core part of the talent management suite and it provides comprehensive learning solutions that uniquely combine formal and informal practices. Learning activities can be tracked easily in the learning plan. Compliance and qualification gaps are highlighted in a pie chart and workflow alerts when qualifications, certificates and/or licences expire and need to be renewed. Central learning teams can push learning activities directly to employees. Know your Talent – Collect valuable information about your employees that provides insight about their backgrounds, experience, expertise, performance, and career aspirations. Identify Talent Gaps – Easily identify current and potential talent gaps in your organisational structure. Assess the impact of loss to your business and gain visibility to your bench strength. Broaden the Nomination Pool – Expand your talent search beyond your immediate sphere by leveraging robust nomination capabilities and an organisation-wide talent search engine. Promote the Right Talent – Identify the right candidates to fill leadership gaps quickly and objectively using competency-based search capabilities and side-by-side comparisons of top candidates. SuccessFactors solutions are maximised for use with mobile devices, whether that be a phone or tablet device. This mobile platform enables SuccessFactors users to stay connected with key HR processes from any mobile device in order that employees can still ’get things done’ on the move or whilst away from their desk. Remain in contact – Managers can know the status of their team and projects. Stay up-to-date – they can receive real-time notifications and review and update ’To-Do’ lists. Instant access – they can ’Log in’ to their account from anywhere to access the Org Chart, Recruiting, and ’To-Dos’. SuccessFactors utilises Dell Boomi AtomSphere, which enables seamless integration from their applications to Boomi’s extensive network. Integration is no longer an obstacle we need to overcome in our implementation processes. Migrate data from legacy HR systems or databases to ensure that no data is lost in your transition to the cloud. Integrate Core HR data in Employee Central to Benefits and Time Management solutions to create a strategic system of record and foundation for all talent decisions. Integrate Employee history and Candidate info from SuccessFactors to payroll to streamline employee on-boarding and termination processes. Use candidate information to/from background screening services and SuccessFactors. Synchronise compensation and benefits to finance and payroll systems to reduce employee on-boarding costs. Align budgets and financial data to strategic goals and performance metrics in order to leverage real-time reporting and drive forecasting and analytics. Multi-Posting is an SAP solution that provides job board aggregation technology for the Recruitment suite. In essence it provides a place where requisitions can be posted to multiple job boards in one place, saving recruiter time and cost, and ensuring that all applications come in to the same recruitment application. Gavdi has partnered with Multi-Posting to offer a Rapid Deployment Solution to our recruitment customers and is available upon request. Fieldglass is the worlds’ largest Vendor Management System (VMS) provider. Its innovative Software-as-a-Service (SaaS) solutions allow organisations to better procure and manage their flexible workforces, including contingent labour, services arranged through Statements of Work, independent contractors and specialized talent pools. As an SAP Gold Partner Gavdi is able to provide SAP Field Glass for contingent workforce management. Concur Technologies is a leading travel management company, wholly owned by SAP, which provides travel and expense management services. As an SAP Gold Partner Gavdi is able to provide SAP Concur Travel & Expense management solutions.